This item is currently out of stock. We apologize for any inconvenience. EasOtic suspension treats infections caused by susceptible strains of yeast and bacteria. How it works: Hydrocortisone is a corticosteroid. Miconazole is an antifungal agent. Gentamicin is an antibiotic. The combination is used for the treatment of ear inflammation and infections associated with certain types of yeast and bacteria in dogs. Dosage & Administration: Always follow the dosage instructions provided by your veterinarian. If you have difficulty applying the medication, contact your veterinarian. Prior to the first use of the dosing canister, prime the pump by depressing the pump 1 to 2 times to fill the canula (clear tip) with a full dose of the product. Carefully insert the canula into the affected external ear canal(s) and apply a single pump of suspension. If you miss a dose, apply it as soon as you remember. If it is almost time for the next dose, skip the application you missed and go back to the regular schedule. This medication should only be given to the pet for whom it was prescribed. 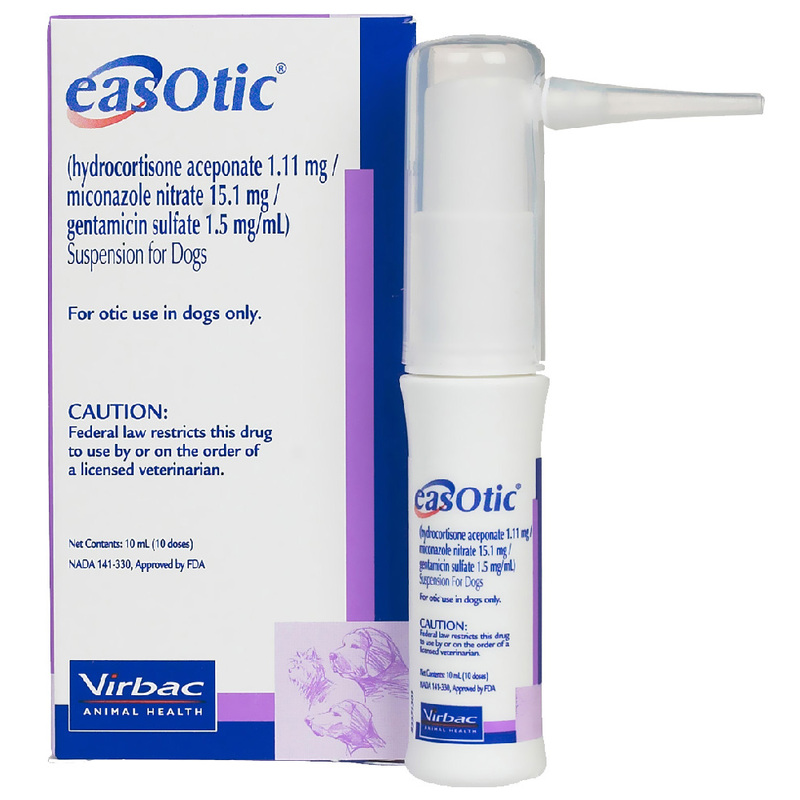 Possible side effects of EasOtic: If ingested, or given at high doses or for prolonged periods of time, side effects related to the hydrocortisone may be seen. The most common effect is an increase in the amount of drinking and urinating. Less commonly may see an increased appetite and weight gain, panting, diarrhea, vomiting, and behavior changes. These effects may be eliminated or reduced by decreasing dosage or frequency of administration, as recommended by your veterinarian. If incoordination, loss of balance or loss of hearing is observed, stop use and contact your veterinarian. Contact your veterinarian if side effects are noticed or if the condition worsens. If your pet experiences an allergic reaction to the medication, signs may include facial swelling, hives, scratching, sudden onset of diarrhea, vomiting, shock, seizures, pale gums, cold limbs, or coma. If you observe any of these signs, contact your veterinarian immediately. If you miss giving a dose: If you miss a dose, give it as soon as you remember. If it is almost time for the next dose, skip the one you missed and go back to the regular schedule. Do not give two doses at once. If you overdose the pet: If you know or suspect your pet has had an overdose, or if you observe any of the side effects listed above, contact your veterinarian immediately. Keep this and all other medications out of the reach of children and pets. What should I avoid while giving EasOtic to my pet: Consult your veterinarian before using this product with other medications, including vitamins and supplements, non-steroidal anti-inflammatory drugs (NSAIDs) such as aspirin, carprofen (Rimadyl), deracoxib (Deramaxx), or etodolac (EtoGesic), other corticosteroids, or potentially ototoxic (toxic to the ear) drugs, since interactions may occur. Who should not take it? Consult your veterinarian before using this product with other medications, including vitamins and supplements, non-steroidal anti-inflammatory drugs (NSAIDs) such as aspirin, carprofen (Rimadyl), deracoxib (Deramaxx), or etodolac (EtoGesic), other corticosteroids, or potentially ototoxic (toxic to the ear) drugs, since interactions may occur.